A short electric pulse is all it takes to generate and release a powerful vacuum in the blink of an eye. The novel vacuum gripper developed by the research team led by Professor Stefan Seelecke at Saarland University enables robot arms to pick up objects and move them around freely in space. The system works without the need for compressed air to generate the vacuum, it is energy efficient, quiet and suitable for use in clean rooms. The specialists for intelligent materials systems make use of artificial muscles, which are bundles of ultrafine shape memory wires that are able to tense and relax just as real muscle fibres do. The wires also function as sensors and can sense, for example, when the gripper needs to readjust or tighten its grip. The situation is quite different in the case of the new vacuum technology that has been developed by Professor Stefan Seelecke of Saarland University and the Center for Mechatronics and Automation Technology in Saarbrücken (ZeMA). The shape-memory vacuum gripper can produce a powerful vacuum using nothing more than a robot arm to guide it into position. It does not require any additional electric or pneumatic drive system, it is light, adaptable, cost-effective to produce, and it runs noiselessly. It only needs electric current – more precisely, it needs small pulses of electric current: one to generate the vacuum and one to release it. No additional electric power needs to be supplied while the gripper is holding an object, even if the object has to be gripped for a long time or if it has to be held at an angle. The technology is based on the shape memory properties of nickel-titanium alloy. 'The term "shape memory" refers to the fact that the material is able to "remember" its shape and to return to that original shape after it has been deformed. If electric current flows through a wire made from this alloy, the wire becomes warmer and its lattice structure transforms in such a way that the wire shortens in length. If the current ceases, the wire cools down and lengthens again,' says Stefan Seelecke, explaining the key underlying material phase transitions. The ultrafine wires therefore contract and relax like muscle fibres, depending on whether an electric current is flowing or not. 'These shape memory wires have the highest energy density of all known drive mechanisms, which enables them to perform powerful movements in restricted spaces,' explains Seelecke. To construct a vacuum gripper, the researchers arrange bundles of these fibres in the manner of a circular muscle around a thin metal disc that can flip up or down, like a frog clicker toy. Applying an electrical pulse makes the wires in the 'muscle' contract and the disc flips position. The disc is attached to a rubber membrane and if the membrane has been placed onto a flat smooth surface, when the disc flips position it pulls on the membrane, creating a strong and stable vacuum. By bundling the wires together, the resulting motion is both powerful and very rapid. 'Multiple ultrathin wires provide a large surface area through which they can transfer heat, which means they can cool down very swiftly. As a result, the bundle of fibres can shorten and lengthen rapidly, making it possible for the gripper to grab or release an object very quickly,' explains Susanne-Marie Kirsch. 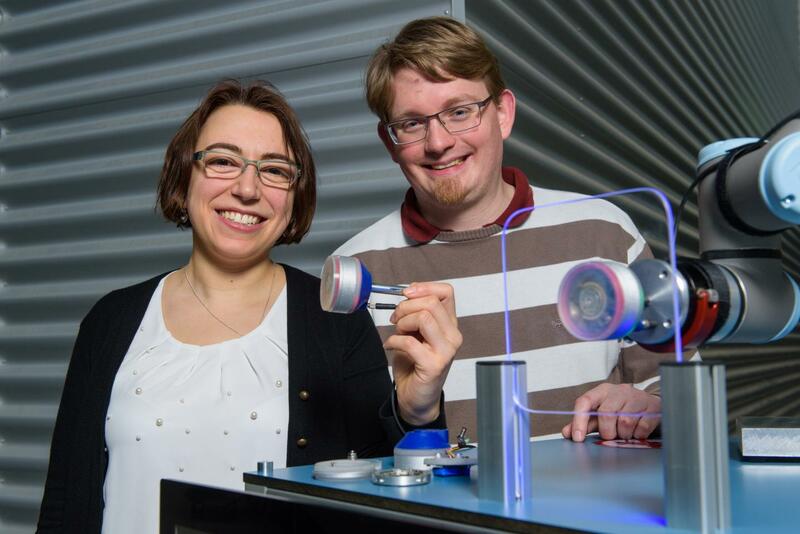 Kirsch and her research colleague Felix Welsch are research assistants within the group and are developing and optimizing the vacuum gripper technology as part of their doctoral research studies. 'Currently, the gripper is able to securely hold objects weighing several kilograms. The gripper's lifting capacity is scalable, with correspondingly more wires being used in large grippers,' explains Felix Welsch. And because the material from which the wires are made has sensory properties, the vacuum gripper is itself aware if the object is not being held securely. 'The wires provide all the necessary information. The electrical resistance data correlates precisely with the extent of deformation of the wires. By interpreting the measurement data, the controller unit therefore knows the exact position of the wires at any one time,' says Professor Seelecke. The gripper thus has an autonomous means of determining whether or not its vacuum is stable enough for the current task. It can also issue warnings in the event of a malfunction or material fatigue.